Click here to sign the petition to support a civil rights investigation of the Chicago ICE office. Today Organized Communities Against Deportations and the Chicago Religious Leadership Network along with the #Not1More Deportation Campaign filed a formal request for a civil rights investigation into tactics used by the Chicago Immigration and Customs Enforcement (ICE) office to conduct immigration raids and deport local residents. 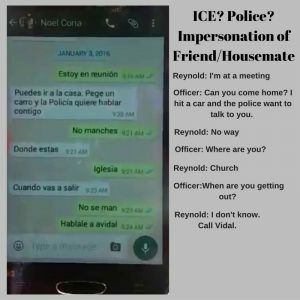 These are the text messages Reynold received from an ICE agent or police officer pretending to be his close family friend. This call for an investigation is based on the behavior of immigration agents during the detention of the Garcia family, during which, amongst other deceptive behavior, they pretended to be local police officers concerned about a close friend of the family who had supposedly been in an accident. This is how they got Reynold Garcia, the father, out of his church where he was seeking solace after his family had been detained. (see texts). The investigation would be done by the DHS Office of Civil Rights and Civil Liberties (CRCL) and the office of the Inspector General (IOG), and it comes just two weeks after CRCL began to look into complaints of use of biometric fingerprinting machines in the racial profiling of a group of Latino workers gathered at a historically known day labor corner in Chicago. Organizers argue that there is a pattern of abuse of power, violations of human and civil rights, and lack of accountability and transparency stemming from the Chicago ICE office, under the direction of Director Ricardo Wong. Below are the documents that support the request for a civil rights investigation and the petition to support the Garcia Family. In January 2016, Chicago Immigration Customs Enforcement (ICE) officers executed a raid that led to the detention and deportation of the Garcia family, an Illinois family of four. 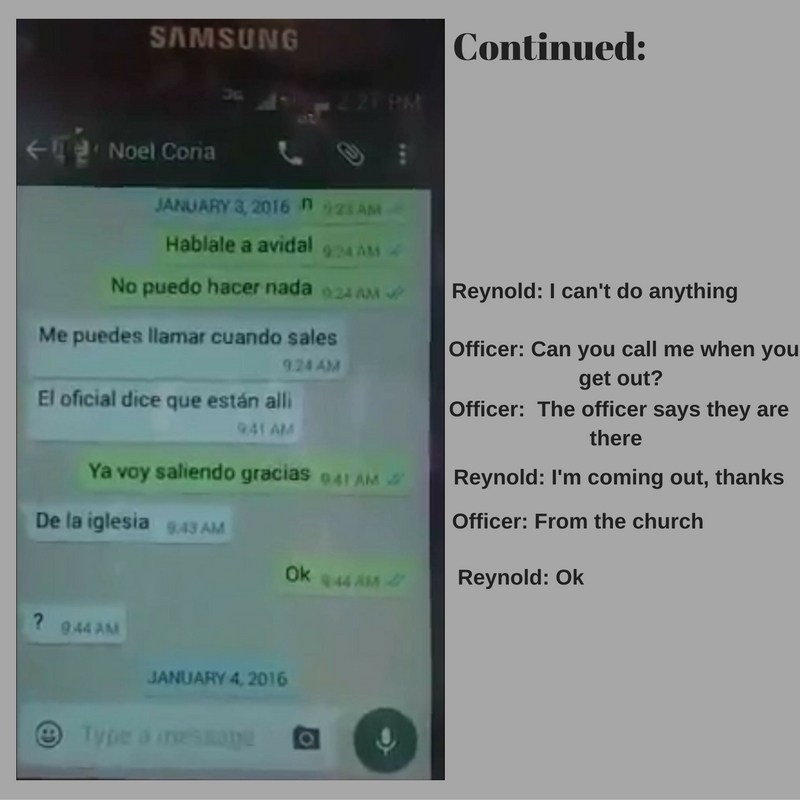 In order to take Mr. Reynold Garcia into custody, immigration agents fabricated a false story involving a family friend suffering a car accident, used a family friend’s cellular phone to lure Mr. Garcia out of the Christian Pentecostal Center, and then impersonated local police before taking him into custody. All of this despite longstanding DHS policy which prohibits immigration raids at churches, schools, and other “sensitive” locations when national security concerns are not present, and despite Mr. Garcia having no criminal record or posing any threat to the public. Just one day before Mr. Garcia was apprehended, Ms. Karen Margarito-Pineda, Mr. Garcia’s wife, and her children were detained in a home raid in which immigration agents again falsely represented themselves as local policy requiring assistance in the apprehension of a suspect to gain access to the family’s apartment. Immigration agents searched through Ms. Margarito-Pineda’s apartment and interviewed her underage children without a warrant and without her informed consent, a clear violation of her civil rights. We are writing to jointly file the present complaint in response to the deceptive methods and tactics utilized in the apprehensions of Ms. Karen Margarito Pineda (“Ms. Margarito”), her children, Santiago and Valentina, and Mr. Reynold Garcia (“Mr. Garcia”) on January 2 and 3, 2016 respectively. We are filing this complaint because we believe that the behavior exercised by agents under the supervision of the Chicago Immigration Customs Enforcement (ICE) Field office may have violated the Garcia family’s civil and due process rights, infringed internal protocols from the Department of Homeland Security (DHS), and violated federal regulations governing agent behavior. On January 2nd, Ms. Margarito received a call from ICE agents who claimed to be local police who needed to question her about a “suspect” she might know. Seeking to fulfill her civic duty, Ms. Margarito agreed to meet the agents at her home. She granted ICE agents access into her home, but only because she had been deceived into thinking they were police who required assistance in order to apprehend a dangerous individual. Once inside, the agents revealed themselves to be with ICE and proceeded to search through Ms. Margarito’s apartment and interview her underage children, without her consent. (See Exhibit A) Although Ms. Margarito asked to see a judicial warrant, she was never shown one. While it is true that federal enforcement agents are allowed to enter an individual’s private home without a judicial warrant, they must first obtain consent. The enforcement tactics exercised by ICE agents are governed by internal agency guidance, including several manuals and handbooks. On Sunday morning, January 3rd, as part of what immigrant rights advocates have characterized as a ‘ruse’, Chicago ICE agents seized the cell phone belonging to Noel Coria, Mr. Garcia’s housemate, without his consent. Based on information and belief, ICE did not obtain a warrant to seize this cell phone. This cell phone was used to send Mr. Garcia text messages, pretending to be Mr. Garcia’s friend, Mr. Coria. They stated that a family friend had suffered an automobile accident. Mr. Garcia also was called on his cell phone. When Mr. Garcia returned the call, the individual on the other end identified himself as local police from the Palatine Police Department, confirmed the supposed accident, and requested Mr. Garcia’s urgent support. When Mr. Garcia shared that he was praying at Christian Pentecostal Center during Sunday morning worship, two unmarked automobiles were sent to the Church. After their arrival to the Church, ICE agents insisted they were local police with Mr. Garcia and at least two other congregants who were present that morning and who also interacted with the Chicago ICE agents. Concerned for his friend, Mr. Garcia Chavez entered one of the automobiles based on the ICE agents’ representations that they were the Palatine police and their statement regarding the purported accident. We have concerns that ICE’s conduct here implicate violations of the Fourth Amendment and its own policies and procedures. Congressional inquiries with the Deputy Chief of the Palatine Police Department and the Chief of Police of the Village of Schaumburg (where Christian Pentecostal Center is located) have indicated that ICE agents did not notify or provide prior communication to either department. If agents did not have permission to impersonate police but they did so anyway, it appears that ICE was in violation of internal agency protocol in the enforcement action carried out against Mr. Garcia at Christian Pentecostal Church. Furthermore, this operation has raised serious community concerns on the extent of local police involvement in this ICE operation. A thorough investigation by the CRCL and OIG is critical so that the community may receive clarity on the extent of local police involvement or lack thereof in this ICE operation and so it can begin to repair damage done to local community-police relations. “This policy is designed to ensure that these enforcement actions do not occur at nor are focused on sensitive locations such as schools and churches unless (a) exigent circumstances exist, (b) other law enforcement actions have led officers to a sensitive location…or (c) prior approval is obtained. The enforcement actions covered by this policy are (1) arrests; (2) interviews; (3) searches; and (4) for purposes of immigration enforcement only, surveillance. Although there are “exigent” circumstances when ICE agents may carry out enforcement actions at sensitive locations, including when there is a “national security or terrorism matter,” we do not find any evidence that these were applicable in the case of Mr. Garcia. If prior approval was granted for the carrying out of this enforcement action, which immigrant rights advocates have reported that Chicago ICE Field Office Director Wong has verbally indicated that he did grant (Exhibit F), the Sensitive Locations memo still requires that “extra care” be taken “when assessing whether a planned enforcement action could reasonably be viewed as causing significant disruption to the operations of the sensitive locations.” The decision to target an individual who posed no serious threat at his place of worship on a Sunday morning, when churches are known to be most full, is deeply concerning. If prior approval was not granted and the decision to execute this operation was made by individual ICE agents, there must be disciplinary action. In addition to impeding community members right of worship, ICE’s operation has sowed fear and distrust of law enforcement. According to the Pastor of Christian Pentecostal Center, the operation has had profound traumatic consequences on that local community and resulted in the departure of individuals who even fear church collusion with ICE and continued targeting. As previously detailed, ICE agents failed to properly identify themselves with both Mr. Garcia and Ms. Margarito. Although the agents revealed they were with ICE after they had entered Ms. Margarito’s home, as explained above, their impersonation of police may have compromised Ms. Margarito’s Fourth Amendment rights. In Mr. Garcia’s case, agents did not identify themselves as ICE until after Mr. Garcia had already boarded their automobile and been driven, without explanation and under false pretenses, several miles away from Christian Pentecostal Church. Conduct a broader investigation into the Chicago ICE Field Office’s systemic use or condonment of such tactics, under the supervision of Director Ricardo Wong, as well as general compliance with the aforementioned ERO policies and regulatory guidance. Consider U-Visa Certification for Reynold Garcia and Karen Margarito Pineda based on the detection of qualified criminal activity in the course of investigation. Thank you for your attention to this urgent and troubling matter. We look forward to your prompt response. Escobar v. Gaines, Case No. 11-cv-00994 *17 (M.D. Tenn, 8 May 2014) (Doc. 441-2) (ERO Fugitive Operations Handbook). On Sunday, January 3rd 2016, I was at a leader gathering at Christian Pentecostal Center in Schaumburg, IL, my family’s church. After my wife and children were taken by ICE agents the day before, I especially needed the solace which church and God provide. Around 9:21 AM, I received a series of text messages from the cellphone number of my housemate, Noel Coria. The messages said he had crashed his automobile and the police wanted to talk with me. I received a missed call from Noel’s number. I returned the call, and I heard the voice of an individual who identified himself as Palatine police officer. He told me that I had to head to our apartment because Noel had gotten into a car accident, that my name appeared on the car title, and that they needed me there to straighten out some insurance issues. He told me that I needed to come only because of the crash and that I could return to the church when we were done. So, I agreed to cooperate with them. I never imagined this was a lie. The officer asked me whether I had a car to drive to the apartment or whether they needed to send a detective to pick me up. I stated that I was at my church and said that they could pick me up. I never imagined ICE agents were using these misrepresentations to come to the church to arrest me. When I exited the church, I saw two dark blue cars in the church parking lot. The cars were unmarked. This felt strange. Two church brothers were with me. My church brothers asked the “police” what the problem was and if they were ICE agents. They responded that they were local police, and that they were there only to take me to my apartment because of the accident that had occurred with Noel Coria. I was convinced they were Palatine police. They never identified themselves, they never showed me any ID before I got into the car. About 5 minutes after we left the church, the agents stopped the car in the parking lot of Moretti’s restaurant in Schaumburg, IL. They made me get out so that they could search me. The ICE agent told me to turn around and immediately handcuffed me. I was then told they were ICE agents and that I was under arrest. From there, ICE quickly processed me for deportation. My name is Karen Sinai Margarito Pineda. I entered the United States around November 2014 asking for political asylum. After being detained for a couple of days with my children, Valentina and Santiago, we were let go. My husband was separated from us and detained for about a month. We settled in the community of Palatine, Illinois. On January 2nd, 2016, I received a call from a woman. She told me she was police and that they needed to ask me some questions about a person. I was told they were only looking for information about a suspect. I told them I was at my apartment. So they came to my apartment. When I opened the door, the uniformed officers immediately entered my home. I recall that there was around eight of them. The officers never showed me a warrant or any type of paper. They told me that they were with ICE and that they would return me and my children to Mexico. They took my son, Santiago, into one of our rooms to question him without my consent. My son cried because of the things they were telling him, that he wouldn’t see his home again and questions about where his dad was and whether Santiago knew how to locate him. I found this behavior to be particularly inappropriate as my son is only 11 and he was very frightened by the agents and their questions. My daughter was not home at the time. The officers made me call to have her brought over from a friend’s home. They said I had to do this because all of us had to go. I had an attorney and wanted to seek my attorney’s assistance because I was confused about what was going on. I requested to call my attorney, but the agents told me that I could not. After this arrest, they also arrested my husband a day later. He was at church one day after ICE picked me and our children up. ICE lured him out of the church and arrested him. The ICE agents ordered me to sign my deportation. They told me that if I did not sign, he would spend more time in jail. I told them I would not sign anything, which angered them. All of us were quickly deported after ICE arrested us. At the end they deported us without caring about my situation and that of my children. It was very sad for us, as we are a peaceful family that never did wrong to anyone. My husband is a leader in Christian Pentecostal Center in Schaumburg, IL. My children participated in church and everything was well until these unexpected events occurred. My name is Noel Coria. I am originally from Mexico, but have been living in the United States for about the last two years. I left Mexico after receiving threats by organized crime. On Sunday, January 3, 2016, I left my apartment at 1924 N. Green Lane, when an unmarked patrol pulled me over just a few minutes from my home. There were also some black and white Palatine police patrols parked nearby. An agent walked up to my car. He did not identify himself. He began asking me for Reynold Garcia, whose name appeared on the title of the car I was driving. I did not know where he was and stated this to him. I asked what they needed him for, but they would not tell me much. The agent just told me they needed to talk to him. I assumed that they were immigration agents from the uniform they were wearing and the questions the agent was making about my immigration status. The agent told me to get out the car and immediately, without any explanation, he handcuffed me. Scared, I asked whether there was a problem. The agent told me “no, not yet…”, implying there could be some later. He did not tell me why I was under arrest. Without my consent, the officer, started searching through the car. They asked if I lived nearby. I said yes. Handcuffed, they took me to my apartment and began to search through my things. An officer asked about Reynold again and I stated again that I did not know where he was. In that moment, one of the officers took my phone out. I didn’t know he had my phone. He must have taken it from the car. One of the officers removed my handcuffs and gave me my phone. The officer told me to call Reynold. I felt scared, threatened, and coerced. I worried about getting in trouble with them, and I feared deportation. I had been told that if I did not tell them where Reynold was they would take me because they had to arrest somebody. I did not feel that I could choose not to obey without risking arrest. Because of that, I complied and called Reynold, but he did not answer. One of the officers then asked for my phone. I handed the phone back because out of fear. When the phone was in the officer’s hand, I heard a message come in. I heard the officer say it was Reynold. That officer told one of the agents, who I had assumed was with immigration, to text Reynold back, instructing him to pass off as me, telling Reynold that I had crashed and that he needed to come to the apartment. Reynold called my phone and the officer answered.. I overheard the officer telling Reynold that they needed to see him. I never gave permission or consent to use my phone. The officer asked Reynold for the address of where he was. Reynold told the officer that he was at the church and then the immigration officers went for him. Through lies, they managed to lure him out of the church to arrest him. On Thursday, May 5, 2016, representatives from the Chicago Religious Leadership Network (CRLN), Organized Communities Against Deportations (OCAD), Mijente/Not1More, the Illinois Coalition for Immigrant and Refugee Rights (ICIRR), and Proyecto de Accion de los Suburbios del Oeste/West Suburban Action Project (PASO), met with leaders from the Chicago Immigration Customs Enforcement (ICE) office. As the Immigration Organizer, I was the CRLN’s representative. Director Ricardo Wong and Assistant Director Sylvia Bonnaccorsi-Manno were among the leadership present from the Chicago ICE office. Several concerns were raised with the leadership of that office. Among other items, we raised concerns with the manner and fashion by which Mr. Reynold Garcia had been detained and deported. In addition to condemning the deceptive tactics used throughout that operation (lying about a friend suffering a car accident, making use of that friend’s cell phone to lure Mr. Garcia out of his church, etc), as advocates we decried what we saw as a clear violation of the 2011 Sensitive Locations Memo which limits operations at or near churches, schools, and other sensitive locations. During that conversation, Director Wong admitted that raids at sensitive locations require prior approval from their headquarters office. When pushed on whether approval was sought in this instance, Director Wong implied that the policy was not relevant in this particular instance even though ICE agents showed up at the church, interacted with congregants, and took Mr. Garcia into custody at the church parking lot. When asked under what circumstances ICE will conduct operations at locations considered to be “sensitive,” Dr. Wong stated that felonies and threats to national security were priority considerations. We pointed out that this was not the case with Mr. Garcia, who had no criminal record. When asked whether his officers sought his approval before carrying out this operation, Director Wong told us that there was nothing wrong with this operation, that he knew the plan, and that he approved it. When asked whether the tactics exercised to detain and deport Mr. Garcia were tactics the Chicago ICE office condoned, Director Ricardo Wong told us that because organizations are telling people not to open their doors to ICE, they have no other recourse but turn to “new” tactics. In other words, when community organizations raised serious concerns on ICE tactics in the Garcia family’s deportation, ICE defended its agents’ conduct, contending that the operation had been thoroughly vetted and approved and that there was absolutely nothing wrong or unusual about the way things were done.